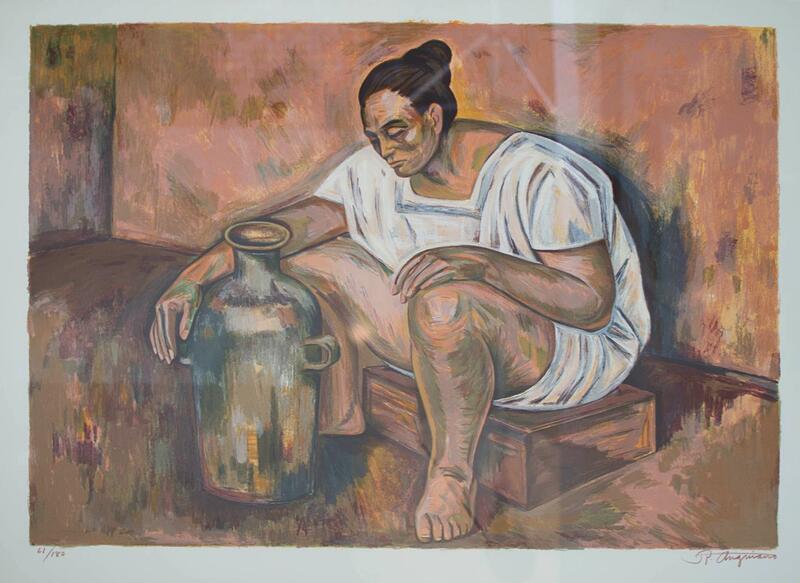 Anguiano was a notable Mexican painter of the 20th century, part of the “second generation” of Mexican muralists which continued the tradition of Diego Rivera, José Clemente Orozco and David Alfaro Siqueiros but experimented with it as well. Anguiano was born during the height of the Mexican Revolution, which would inspire a majority of his mural painting. He studied painting in his hometown of Guadalajara before moving to Mexico City to begin his career. His first major exhibition was held at the Palacio de Bellas Artes, at age 20. His works include over 100 individual and collective exhibitions with 50 murals, mostly in Mexico and the United States. As he continued his artistry with aspects of the Mexican muralism movement, he also experimented with other styles such as Cubism, Surrealism and Expressionism, with themes such as clowns and prostitutes. However, his most famous painting is “La espina” (The thorn) which depicts a Mayan woman digging a thorn out of her foot with a knife. His later works concentrated on depicting Mexico in vivid colors and traditional imagery.